Marc Marquez hosted a Motocross camp today in Rufea in his latest venture to aid children's health care. The double MotoGP champion has taken a key interest in the specialised care to children with neurological disabilities and used the camp to help raise awareness of the Nexe Foundation. With 20 children from around the world, including two British riders, invited to the training camp Marquez was able to instruct them on motocross at his home circuit. The British riders were Lincoln's Jack Belland Ross Turner from Shropshire. 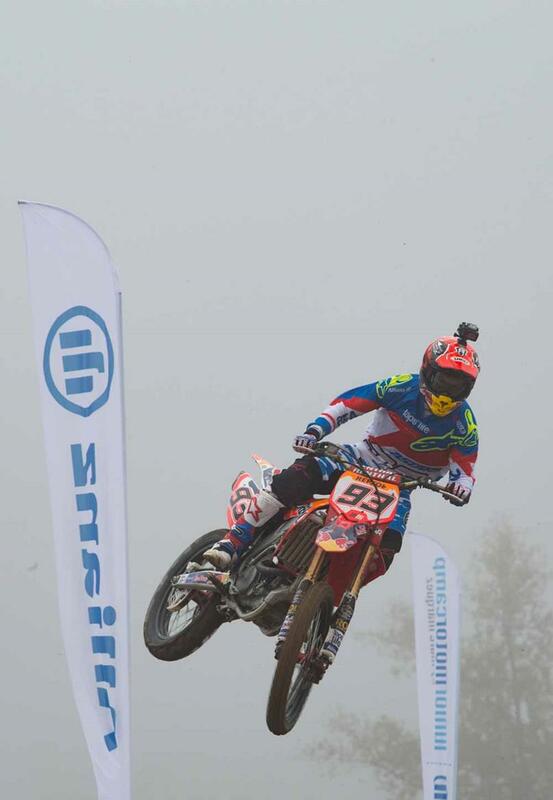 Turner races in Spanish championships as well as British championships while Bell races British championship motocross, speedway and grass track. For Marquez the camp was a chance to bring together 20 children with a range of talents and offer them instruction with his brother Alex and numerous Spanish motocross stars as fellow instructors. The central theme of the three day camp was for riders to train and race with their safety in mind. While the camp was an opportunity for Marquez to get away from the hustle and bustle of a Grand Prix weekend the results of 2015 were never far from the minds of those present. Having lost a premier class title for the first time Marquez was asked if he'd consider changing his approach to racing in the future. "It obvious that sometimes it is easier to win the world championship by being prudent and conservative instead of taking risks and always give 100% but in the end you need to find a compromise," said Marquez. "The conservative rider might arrive to the end of the season thinking ‘those four of five extra points would have been very useful now’ whereas when you are more impulsive you risk that crash and throwing away twenty-five points or more. "You have to find the right balance. I won two titles in MotoGP by always giving 100% and always going for the win but this championship produced too many ‘zeros’. If you feel good and the bike works well then it is always better to be aggressive, brave and risky and in this way I think you will win more titles." In addition to training kids Marquez was also joined by Formula 1 driver Nico Rosberg on site with the German taking the time to turn some laps on a very different machine to what he is used to. “I had great fun out there and the enthusiasm of the kids was really infectious," said Rosberg. For Rosberg having someone of Rosberg's stature join him for the camp was important as it will help him to raise the profile of the event and the Nexe Foundation. “It was great to meet Nico today and push our worlds together," said Marquez. "I’m most grateful for Nico’s support for Laps for Life 93 and the fund-raising we are doing for the Nexe Foundation – bringing the power of two sports together I am sure will help to raise plenty of awareness. And it was great to see Nico on a motorbike. Next time we get together, it will be me on four wheels!"